In his recently released report on the right of everyone to the enjoyment of the highest attainable standard of physical and mental health, the UN Special Rapporteur Dainius Pūras has urged States and psychiatrists to transform a system currently operating on outdated conceptualisations and poor evidence. 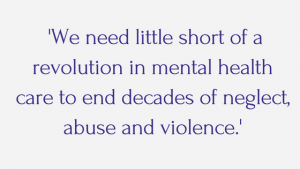 ‘We need little short of a revolution in mental health care to end decades of neglect, abuse and violence’ said Pūras after presenting his report to the UN Human Rights Council in Geneva. The report ‘seeks to make a contribution to the important discussions underway as mental health emerges from the shadows as a global health priority’ (Human Rights Council, 35th session, 6-23 June 2017) and is the result of extensive consultations with stakeholders including people with lived experience, people with psychosocial disability, users and former users of mental health services, civil society representatives, mental health practitioners (including psychiatrists) and the WHO, academic experts, members of UN human rights mechanisms and representatives of UN member states. Biased use of evidence in mental health, in particular the overprescription and overuse of psychiatric drugs – not to discount that there are some benefits, but that the bias towards a biological model has ‘outsize influence informing resource allocation and guiding principles for resources and services’. The report goes on to outline the right to mental health framework which encompasses States’ obligations, international cooperation, participation, non-discrimination, accountability, availability, acceptability (ethical, culturally appropriate, sensitive to diversity and life stage and promoting of choice, autonomy and dignity), and quality. It argues that consent is a core element of the right to health and that immediate steps to a ‘radical reduction and eventual elimination’ of coercion and force must be taken. Instead of hospitals and medications, the focus should be ‘building a society in which everyone can thrive’. 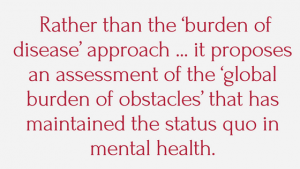 The report concludes that ‘the crisis in mental health should be managed, not as a crisis of individual conditions, but as a crisis of social obstacles which hinders individual rights. 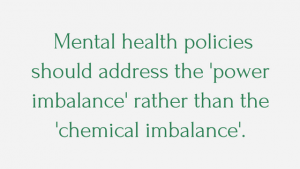 Mental health policies should address the “power imbalance” rather than the “chemical imbalance”.’ It points to the right to health framework as a crucial guide to the development of rights-based policies and investments which aim to achieve dignity and well-being for all, and calls for rights-based mental health innovations to be embedded in public policy. It also makes specific recommendations to address the imbalance of the biomedical approach in mental health, address social and underlying determinants for the promotion of mental health for all, and ensure that health-care services guarantee the right to mental health for all.